If my photo alone doesn’t give you nightmares, know that this spider — or at least the one I saw, anyway — has literally as big as my hand when the fingers are all outstretched, as if I’m waving hello to the thing that wants to kill me. The spider made a repeat appearance on my blog, after an article in the Telegraph noted that a certain member of this species — the same one I saw? quite possibly? and I’m a hero now? — caught and killed a bird. A bird. A BIRD. An organism that was even bigger than it and that has mastered the power of flight. Now the most horrifying spider ever gets a third appearance here on Back of the Cereal Box, as a result of some stellar detective work done by Dina, who had the initiative to look the thing’s genus up on Wikipedia. Dina found that the genus Nephila, according Japanese folklore, is associated with a the jorogumo, a monstrous arachnid that can take on the appearance of a beautiful woman. 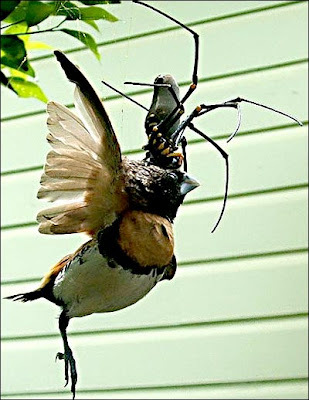 The word jorogumo can also refer to actual Nephila spiders — that is, the things people might see hanging from trees, in their non-seductress form — and that’s all fine and good except for the fact that jorogumo literally means either “binding lady” or “whore spider,” depending on how it’s written. And guess which one I find more interesting. There you have it: another reason to hate this particular spider. In addition to striking terror into the hearts of mammals everywhere and also being far bigger than arachnids have any good reason to be, it also has loose morals. Whore spider. Ha. When you hear Goleta, think JUMPING SPIDERS! Thank you. Thank you for this. I am now going to go to sleep tonight dreaming of that horrific spider. There's this spider that lives in the corner of the roof that is above our front door, and it's this tiny quarter sized thing, but brown and stripey. I literally run past it when I leave my house in the morning. Recently, I screamed and yelled "KILL IT!! KILL IT!!!" to my boyfriend when I saw a pinhead sized spider crawl on my dashboard. Spiders like that make me not want to go anywhere, ever! "Whore Spider" doesn't make it any less amusing or scary for me, lol. black widows spiders control sacramento is here. You gotta be kidding. Horrific? Not only do spiders control the VAST populations of insects, many of whom can be pests we spend good MONEY to control, but they are an eligant and misunderstood spicies that should not be feared due to hollywoods inbred and frankly absurd demonization.